It’s likely that about 30 percent of round bale users are not removing the net wrap or twine on bales before feeding or processing. That was a finding from the South Dakota State University (SDSU) online survey that was conducted last December and completed by 548 farmers and ranchers. The majority of respondents, 80 percent, were cow-calf producers. Feedlot, dairy, and sheep producers comprised the remaining 20 percent. The results were recently reported on SDSU’s iGrow website. Not surprisingly, two-thirds (67 percent) of the respondents used net wrap as their binding source. Twenty-six percent used twine, while 6 percent alternated between the two binding sources depending on whether the bales would be fed to their own livestock or sold for hay. • Fifty-four percent removed net wrap or twine before feeding whole bales either in a bale feeder or on the ground. • Eleven percent removed the binding prior to grinding or processing bales. • Twenty-four percent did not remove net wrap or twine prior to feeding whole bales or processing bales. • Eleven percent sometimes removed binding material before feeding bales to livestock. “When we asked those producers who did not remove the binding prior to feeding, 46 percent said they have observed livestock eating the net wrap or twine that remained on the ground,” Grussing notes. The extension specialist says that even when forages are ground and processed with intact binding, long strands of plastic material can remain and will accumulate in the animal’s rumen over time. The symptoms of net wrap or twine impaction in the gut include reduced feed intake and performance. Grussing notes that the obvious best management practice is to remove all binding from bales before feeding or processing; however, there are some understandable obstacles in terms of time and labor, especially during winter. 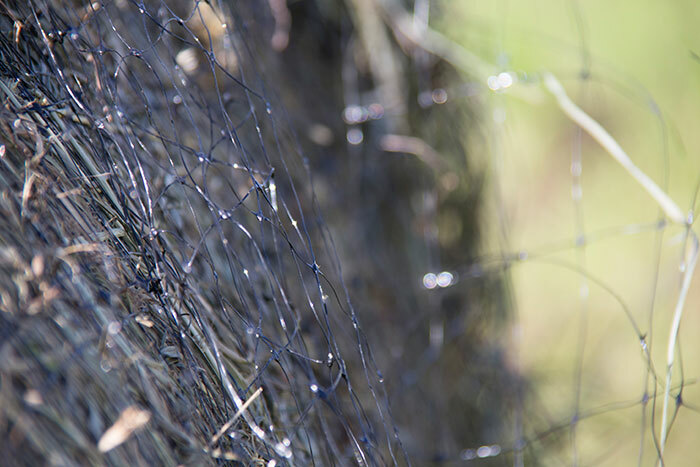 Although there are currently sisal twine and biodegradable binding materials available, 86 percent of survey respondents indicated that they would have an interest in a cost-effective digestible net wrap or twine product. If developed, it would also need to be of equal strength and environmentally stable. Grussing notes that the average death loss on a cow-calf operation is 2 percent. If a farm or ranch’s death loss is higher than that benchmark, she encourages producers to contact their veterinarian and perform some postmortem exams to ensure the higher mortality rate is not being caused by excessive binding ingestion. Until better alternatives are available, Grussing says she will continue to assist livestock producers in understanding the long-term impacts of binding ingestion by cattle. The extension specialist will also pursue research on practices that will minimize the problem.